This short series has been looking at Winslow Homer’s paintings from Cullercoats. I have shown how he pictured the fishlasses and fishwives watching for the return of the boats, working ashore, and the bustling activity when their boats came in. By all accounts, life in Cullercoats changed greatly during the summer, when itinerant musicians and street entertainers toured through the village, and miners from the nearby coalfields visited it as a beach resort. Despite being in the community for two complete summers, Homer showed not even a brief glimpse of that. Instead he concentrated on the fishing community, and its womenfolk in particular. 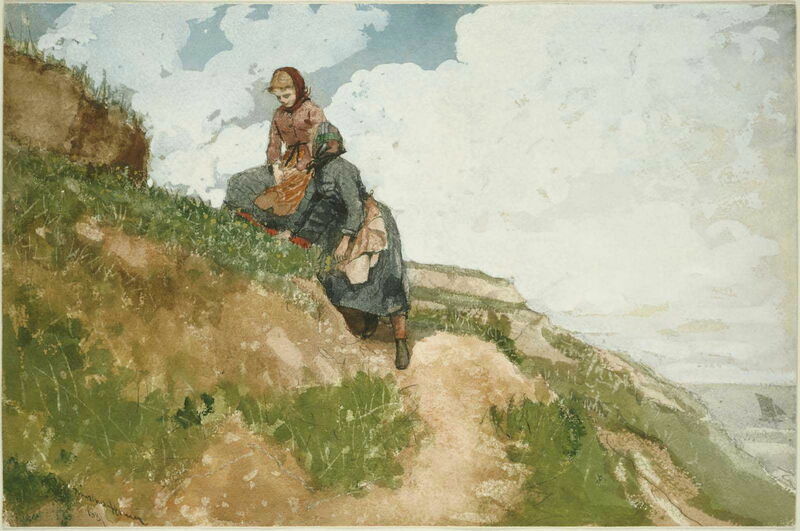 Every moment that these women and girls are pictured, they are active: here on the cliffs in the summer they are gathering yellow flowers, perhaps to sell to visitors. 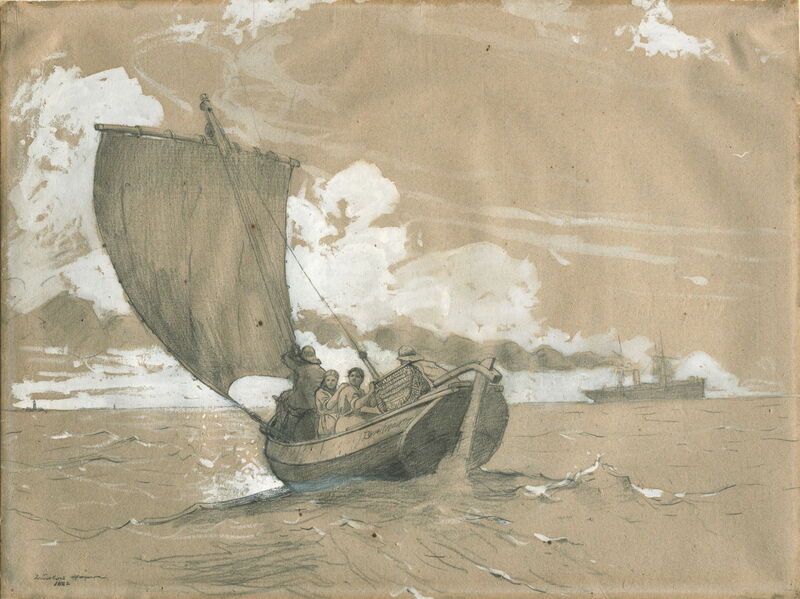 Winslow Homer (1836–1910), Fishing off Scarborough (1882), graphite and opaque white watercolor, with traces of black chalk, on medium weight, slightly-textured, tan laid paper with blue and red fibers, 46.2 × 61.8 cm, Art Institute of Chicago, Chicago, IL. Wikimedia Commons. Some accounts of Homer’s paintings dwell on the segregation of the sexes which appears in many of them. Apparently drawn further south down the coast from Cullercoats, his sketch Fishing off Scarborough (1882) shows two fishwives at sea with two men. Although his production of sketches and watercolour paintings appears to have been quite intense and sustained, Homer also painted a few works in oils whilst at Cullercoats. His Hark! The Lark! (1882) was shown at the Royal Academy in London in 1882, but does not seem to have had much impact. It lacks the remarkable freshness and spontaneity of his watercolours, resembling the rustic Realism of Jean-François Millet, perhaps. It raises the question, though, of how much he travelled away from Cullercoats during the 19 months in which he lived there. Some have claimed that he journeyed significantly further north, perhaps even to Scotland, and as far afield as Wales. In the absence of either paintings or documentary evidence, these appear unlikely. Some have pondered Homer’s relationship with his models, although all the evidence is that it was entirely professional. Winslow Homer’s lifestyle was so upright and sober that several potential biographers apparently declined the opportunity to write books about him because of the difficulty they would have in retaining the reader’s interest. One model, a redheaded girl of 15 years age at the time, has been identified as Maggie Jefferson (later marrying to become Mrs Maggie Storey, and having 17 children), who lived on Bank Top near Homer’s studio. She was often paid the shilling which he gave his models for a sitting. It was a lot of money to them in 1881, and made him a generous donor to the budgets of many Cullercoats families. The Life Line (1884), which I show and discuss below. Composite details showing girls in red stockings in Winslow Homer’s Cullercoats paintings. See text for further information. 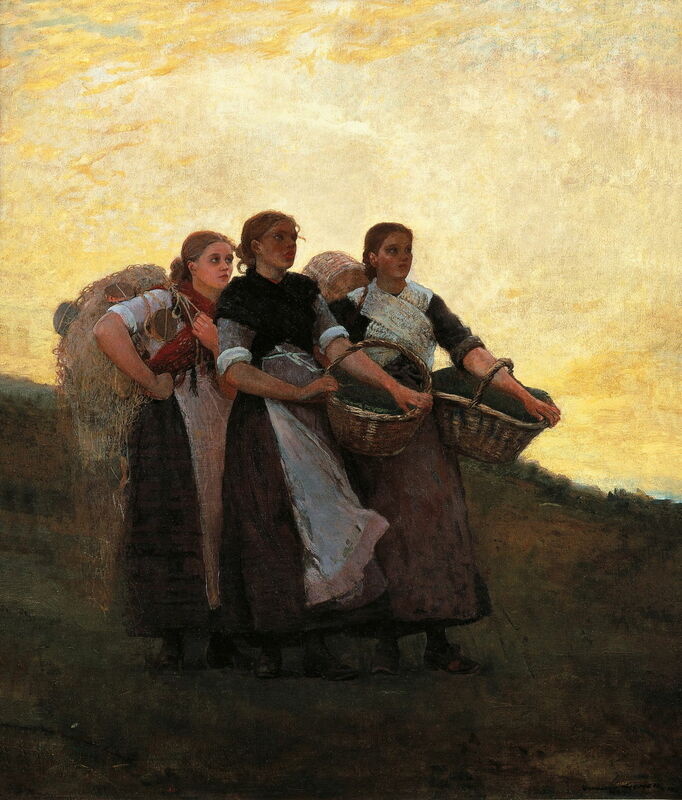 Winslow Homer was already making the shift from painting in opaque watercolour before he went to Cullercoats, and was adept at the techniques used by Turner and other masters to get the best from them. He had switched to Winsor & Newton’s paints on Whatman paper, considered to be the finest of the day. His studies of Turner’s and other work in London, and his understanding of colour perception, helped him create a succession of superb paintings, with remarkable spontaneity and richness of gesture, masterful composition and use of colour. Individually many are among the greatest watercolours of all time, and viewed as a group they must be almost unique. Superficially, Homer’s response was to turn back and paint more American themes and scenes. In doing so, he transferred what he had learned at Cullercoats, and often revisited its people and their lives. 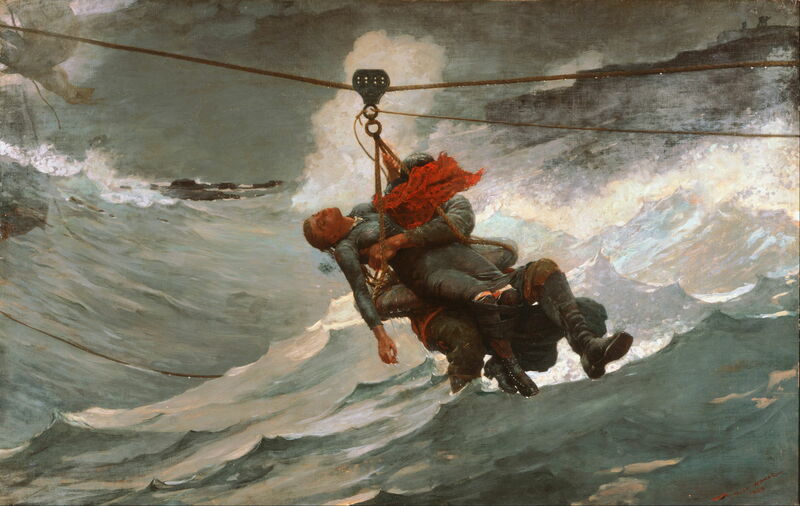 Early success came with The Life Line (1884), a work in oils which was ostensibly inspired by the rescue of a young woman from shipwreck off Atlantic City, New Jersey, in the summer of 1883. But look carefully at that provocative, almost erotically-charged woman, and is she not one of the fishlasses from Cullercoats, complete with flashes of red in her shawl and legs? This sold almost immediately it went on show, for $2,500, and marked the start of Homer’s commercial success. 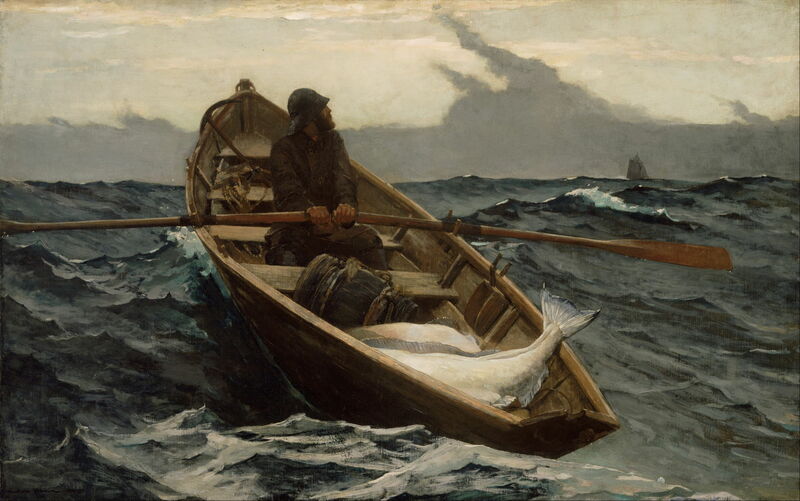 There followed a series from the even harsher conditions fishing off the Grand Banks of Newfoundland, including The Fog Warning (Halibut Fishing) (1885), again in oils. For these Homer went out with the herring fleet in 1884, which must have stirred fond memories of the fishermen of Cullercoats. Winslow Homer (1836–1910), Sharks (The Derelict) (1885), watercolor over graphite on cream, moderately thick, moderately textured wove paper, 36.8 × 53.2 cm, Brooklyn Museum, New York, NY. Wikimedia Commons. 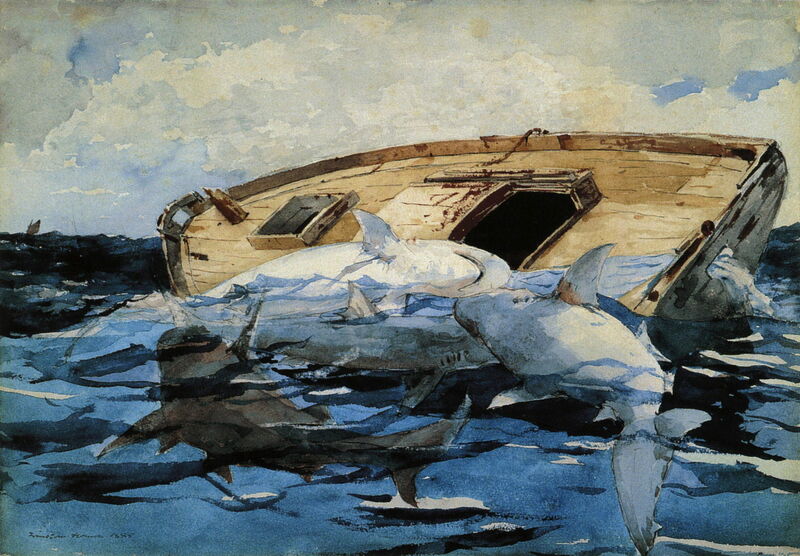 Watercolours such as Sharks (The Derelict) (1885) showed that his time at Cullercoats had brought about lasting change, which ensured his well-deserved reputation as one of America’s greatest painters. In the next and last article in this series, I will try to assemble the large-scale narrative from a selection of the very best of Homer’s paintings of Cullercoats. Awe inspiring work which tempts me to just TRY to copy aspects of his technique. Truly astounding magnificent work. I had written to you once before about a possible study have from Cullercoats. So interested in what you have to say. Have you considered the inclusion of the trawler, and the Priory in many of the painting and sketches? I am also hunting for fisherman wearing a derby type of hat, not the southwester. ( the Return). Just noticed another in Breakwater- Cullercoats. It also has the trawler and the priory in it. Thank you, Anne. Have you been able to locate an expert reasonably local to you who can take a look at the painting? I’m afraid that I haven’t been looking through any of Homer’s work recently – but I’m sure that I’ll return to it later this year. My Great Grandmother, Ida Meserve Harding was thee model Homer used in “The Fisher Girl” (she was 16) and later “Light on the Sea”. I believe she was 19 then. She lived at Prout’s Neck in Scarborough where he had his studio. After she married my Great Grandfather, Charles Harding, they lived in Pine Point across the river from Prout’s Neck and he would row her in his boat for her sittings. She asked for a few days off to get married to Charles Harding. 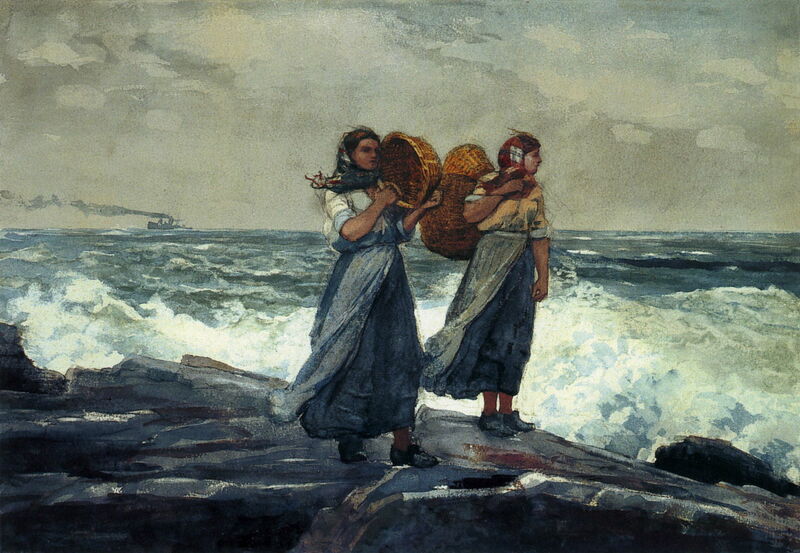 Winslow Homer gave her $3.00 as a wedding gift (which was a lot of money) and then he added a gold band on her wedding finger in the painting Light on the Sea. Thank you – how fascinating. I love the touch of adding the gold band in that painting. Do you still live locally? It would be interesting to compare his paintings with how those places look now.